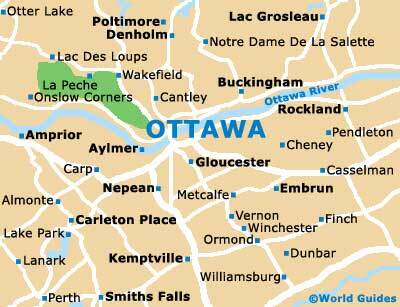 Full of places to eat, Canada's capital city of Ottawa has much to offer in the way of restaurants and dining venues. Ranging from coffee shops with outdoor tables to five-star restaurants with impressive city views, Ottawa's dining scene will not disappoint. The cuisine in Ottawa is distinctly varied, with food from all over the world, including French, Chinese, Italian, Mexican and Spanish restaurants. Although there is no specific Ottawa cuisine, the city's restaurants are often strongly influenced by the nearby French / Quebec fusion across the river, which is famous throughout Canada. Considering that Ottawa is a wealthy city, full of corporations and suits, restaurants are usually reasonably priced and a three-course meal is often surprisingly affordable. Restaurants in Ottawa generally conform to standard opening hours in Canada, although some eateries may vary according to the location and type of food being served. Breakfast venues in Ottawa begin to open from 06:00 onwards, with most coffee shops in the downtown district filling up between 08:00 to 09:00. Lunchtime restaurants in Ottawa often start serving brunch options from 10:00 onwards and many stay open until as late as 15:00, when they close to prepare for dinner. Ottawa's evening restaurants and dining venues usually open from 17:00 or 18:00, staying open until 22:30 or later, especially on Friday and Saturday nights. A number of large restaurants in the city center also offer early-bird discounts as early at 16:30. 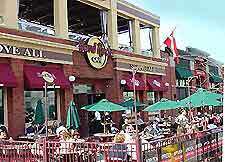 Many of the best restaurants in Ottawa stand along Bank Street in the downtown district. This is a vibrant area of the city and is lined with shops, cafés and eateries. For lunchtime snacks and quick meals, downtown Ottawa contains a number of fast-food restaurants and chip wagons, which serve French fries, burgers and 'poutine' - fries covered in cheese and gravy. Food courts in nearby shopping centers also offer a selection of inexpensive eateries and buffet-style lunches. 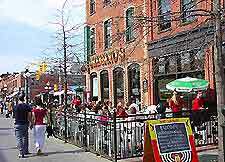 The Byward Market area of Ottawa is home to an array of trendy restaurants and eateries, many of which provide outdoor eating areas during the warm summer months. 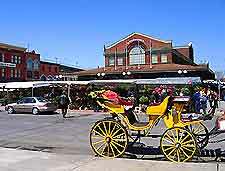 Ottawa's popular central market area is particularly appealing and can become rather busy at the weekends. A specialty of this area, 'beavertails' are hot, freshly made flat doughnuts and are often for sale in the Byward Market building, which stands at the end of York Street. Further restaurants in Ottawa can be found to the south of the Parliament Hill area, and in the small Chinatown district on the corner of Bronson Avenue and Somerset Street West, where you will find a small selection of traditional Chinese and Vietnamese restaurants. If you have a taste for Indian cuisine, head to the Glebe area, while for lovers of Italian restaurants, look no further that the Little Italy district, which stands along Preston Street. Also, a number of exclusive restaurants offer superb views of the Rideau Canal and include Ottawa's Canal Ritz, an Italian restaurant with an extensive outdoor patio area.